Mikhail Sergeyevich Gorbachyov (Russian: Михаи́л Серге́евич Горбачёв, commonly anglicized as Gorbachev; born March 2, 1931) was leader of the Soviet Union from 1985 until its demise in 1991. The first Soviet leader to be born after the revolution, he tried to reform the Soviet Union with his policies of glasnost (openness) and perestroika (restructuring), attempting to infuse the communist society and economy with a market dynamism. Gorbachev was wildly popular in the West, largely because of the way he managed the dismantling of the Soviet empire, allowing the Berlin Wall and Iron Curtain to fall without Soviet military interference. His attempts at reform helped to end the Cold War, but also ended the political supremacy of the Communist Party of the Soviet Union (CPSU), unintentionally resulting in the dissolution of the Soviet Union on Christmas Day, 1991. 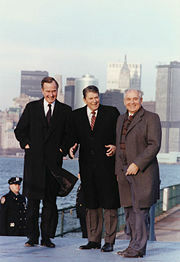 Gorbachev developed enduring friendships with several major Western political leaders of that era: U.S. presidents Ronald Reagan and George H. W. Bush, and British Prime Minister Margaret Thatcher. Gorbachev is considered one of the most important world political leaders of the second half of the twentieth century. For his efforts in ending the Cold War, he was awarded the Nobel Peace Prize in 1990. However, because of the difficulties experienced by the Russian people after the Soviet collapse, Gorbachev has since enjoyed little political popularity at home. Gorbachev was born into a peasant family in the village of Privolnoye near Stavropol. The son of Russian agricultural mechanic Alexi Gorbachev and Maria Pantelyeva, he faced a tough childhood under the totalitarian leadership of Josef Stalin; his grandparents were deported for being richer farmers known as kulaks. Despite the hardship of his background, he excelled in the fields and in the classroom. He was considered the most intelligent in his class, with a particular interest in history and mathematics. After he left school he helped his father harvest a record crop on his collective farm. For this he was awarded the Order of the Red Banner of Labor at age 19, an unusual honor for someone his age. It was almost certainly this award, coupled with his intelligence that helped secure his place at Moscow University, where he studied law. While living in Moscow, he met his future wife, Raisa. They married in September 1953, and moved to Gorbachev's home region of Stavropol in southern Russia when he graduated in 1955. Gorbachev joined the CPSU in 1952 at the age of 21. In 1966, at age 35, he obtained a correspondence degree as an agronomist-economist from the Agricultural Institute. His career moved forward rapidly, and in 1970, he was appointed first secretary for agriculture, and the following year made a member of the Central Committee. In 1972, he headed a Soviet delegation to Belgium and two years later, in 1974, he was made a representative to the Supreme Soviet, and chairman of the Standing Commission on Youth Affairs. In 1979, Gorbachev was promoted to the Politburo, the highest ruling body in the USSR. There, he received the patronage of Yuri Andropov, head of the KGB and also a native of Stavropol. Gorbachev was quickly promoted during Andropov's brief tenure as leader of the party (November 12, 1982–February 9, 1984). Given responsibility over personnel, under the tutelage of Andropov, Gorbachev replaced 20 percent of the top echelon of government ministers and regional governors, often with younger men. During this time Grigory Romanov, Nikolai Ryzhkov, and Yegor Ligachev were elevated, the latter two working closely with Gorbachev, Ryzhkov on economics, Ligachev on personnel. He was also close to Konstantin Chernenko, Andropov's successor, serving as second secretary. His positions within the new CPSU created more opportunities to travel abroad and this would profoundly affect his political and social views in his future role as leader of the Party. In 1975, he led a delegation to West Germany, and in 1983 he headed a Soviet delegation to Canada to meet with Prime Minister Pierre Trudeau and members of the Canadian House of Commons and Senate. In 1984, he traveled to the United Kingdom, where he met with Prime Minister Margaret Thatcher. Upon the death of Chernenko, Mikhail Gorbachev, at age 54, was elected general secretary of the Communist Party on March 11, 1985. He became the party's first leader to have been born after the Russian Revolution of 1917. As de facto ruler of the Soviet Union, he tried to reform the stagnating Communist Party and the state economy by introducing glasnost ("openness"), perestroika ("restructuring"), and uskoreniye ("acceleration" of economic development), which were launched at the 27th Congress of the CPSU in February 1986. Domestically, Gorbachev implemented economic reforms that he hoped would improve living standards and worker productivity as part of his perestroika program. However, many of his reforms were considered radical at the time by orthodox apparatchiks in the Soviet government. In 1985, Gorbachev announced that the Soviet economy had stalled and that reorganization was needed. Initially, his reforms were called "uskoreniye" (acceleration) but later the term "perestroika" (reconstruction) became much more popular. Gorbachev was not operating within a vacuum. Although the Leonid Brezhnev era is usually thought of as one of economic stagnation, a number of economic experiments (particularly in the organization of business enterprises, and partnerships with Western companies) did take place. A number of reformist ideas were discussed by technocratic-minded managers, who often used the facilities of the Young Communist League as discussion forums. The so-called "Komsomol Generation" would prove to be Gorbachev's most receptive audience, and the nursery of many post-communist businessmen and politicians, particularly in the Baltic States. The first reform introduced under Gorbachev was the 1985 alcohol reform, designed to fight wide-spread alcoholism in the Soviet Union. Prices on vodka, wine, and beer were raised, and their sales were restricted. People who were caught drunk at work or in public were prosecuted. Drinking on long-distance trains and in public places was banned. Many famous wineries were destroyed. Scenes of alcohol consumption were cut from movies. Unfortunately, the reform did not have any significant effect on the alcoholism in the country, but economically it was a serious blow to the state budget (a loss of approximately 100 billion rubles according to Alexander Yakovlev) after alcohol production migrated to the black market economy. Alcohol reform was one of the initial triggers that caused a chain of events that ended with the collapse of the Soviet Union and deep economic crisis in the newly formed Commonwealth of Independent States six years later. The Law on Cooperatives, enacted in May 1988, was perhaps the most radical of the economic reforms during the early part of the Gorbachev era. For the first time since Vladimir Lenin's New Economic Policy, the law permitted private ownership of businesses in the services, manufacturing, and foreign trade sectors. The law initially imposed high taxes and employment restrictions, but these were later revised to avoid discouraging private-sector activity. Under this provision, cooperative restaurants, shops, and manufacturers became a legally recognized part of the Soviet economy. It should be noted that some of the republics ignored these restrictions. In Estonia, for example, co-operatives were permitted to cater to the needs of foreign visitors and forge partnerships with foreign companies. The large "All-Union" industrial organizations started to be restructured. Aeroflot, the state-owned Soviet airline, for example, was split into a number of independent enterprises, some of which became the nucleus for future independent airlines. These newly autonomous business organizations were encouraged to seek foreign investment. Gorbachev's introduction of glasnost gave new freedoms to the people, particularly freedom of speech, although these freedoms were not comparable to those found in western democracies. In a country in which censorship, control of speech, and suppression of government criticism, had previously been a central part of the system, this was a radical change. The press became far less controlled, and thousands of political prisoners and many dissidents were released. Gorbachev's goal in undertaking glasnost was to pressure conservatives within the CPSU who opposed his policies of economic restructuring, and he also hoped that through different ranges of openness, debate, and participation, the Soviet people would support his reform initiatives. In January 1987, Gorbachev called for democratization: The infusion of democratic elements such as multi-candidate elections into the Soviet political process. In June 1988, at the CPSU's Twenty-Seventh Party Conference, Gorbachev launched radical reforms meant to reduce party control of the government apparatus. In December 1988, the Supreme Soviet approved the establishment of a Congress of People's Deputies, which constitutional amendments had established as the Soviet Union's new legislative body. Elections to the congress were held throughout the USSR in March and April 1989. On March 15, 1990, Gorbachev was elected as the first president of the Soviet Union. 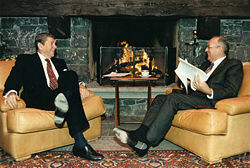 In international affairs, Gorbachev sought to improve relations and trade with the West. He established close relationships with several Western leaders, such as West German chancellor Helmut Kohl, U.S. presidents Ronald Reagan and George H. W. Bush, and British prime minister Margaret Thatcher—who famously remarked: "I like Mr Gorbachev—we can do business together." On October 11, 1986, Gorbachev and Reagan met for the first time in Reykjavík, Iceland to discuss reducing intermediate-range nuclear weapons in Europe. To the immense surprise of both men's advisers, the two agreed in principle to removing INF systems from Europe and to equal global limits of one hundred INF missile warheads. This culminated in the signing of the Intermediate-Range Nuclear Forces Treaty (INF) in 1987. In February 1988, Gorbachev announced the withdrawal of Soviet forces from Afghanistan. The withdrawal was completed the following year, although the civil war continued as the Mujahedin pushed to overthrow the pro-Soviet Mohammad Najibullah regime. An estimated 15,000 Soviets were killed between 1979 and 1989 as a result of the conflict. Also during 1988, Gorbachev announced that the Soviet Union would abandon the Brezhnev Doctrine, allowing Eastern bloc nations to determine their own internal affairs. This policy of non-intervention in the affairs of other Warsaw Pact states proved to be the most momentous of Gorbachev's foreign policy reforms. Moscow's abandonment of the Brezhnev Doctrine led to a string of revolutions in Eastern Europe throughout 1989, in which communism collapsed. With the exception of Romania, the popular upheavals against the pro-Soviet communist regimes were all peaceful ones. The loosening of Soviet hegemony over Eastern Europe effectively ended the Cold War, and for this, Gorbachev was awarded the Nobel Peace Prize on October 15, 1990. While Gorbachev's political initiatives led to greater freedom and democracy in the Soviet Union and Eastern Europe, the economic policy of his government gradually brought the country close to disaster. By the end of the 1980s, severe shortages of basic food supplies (such as meat and sugar) led to the reintroduction of the wartime system of distribution using food cards that limited each citizen to a fixed amount of product per month. During his administration the state deficit grew from 0 to 109 billion rubles; gold funds decreased from 2,000 to 200 tons; and external debt grew from 0 to US$120 billion. Furthermore, the democratization of the USSR and Eastern Europe had irreparably undermined the power of the CPSU and Gorbachev himself. Gorbachev's relaxation of censorship and attempts to create more political openness had the unintended effect of re-awakening long-suppressed nationalist and anti-Russian feelings in the Soviet republics. Calls for greater independence from Moscow's rule grew louder, especially in the Baltic republics of Estonia, Lithuania, and Latvia, which had been annexed into the Soviet Union by Stalin in 1940. Nationalist feeling also took hold in the Soviet republics of Georgia, Ukraine, Armenia and Azerbaijan. Gorbachev had unleashed reforms that would ultimately let loose the constituent socialist republics of the Soviet Union. On January 10, 1991, Gorbachev issued an ultimatum-like request to the Lithuanian Supreme Council, demanding the restoration of the validity of the constitution of the USSR in Lithuania and revoking all anti-constitutional laws. The next day Gorbachev approved the attempt of the Soviet military to overthrow Lithuania's government. As a result, at least 14 civilians where killed and more than six hundred injured on January 11-13, 1991 in Vilnius, Lithuania. The strong Western reaction and the actions of Russian democratic forces put the president and government of the Soviet Union into an awkward situation, as news of support for Lithuanians from Western democracies started to appear. Gorbachev's response to growing republic separatism was to draw up a new treaty of union which would have created a truly voluntary federation in an increasingly democratized Soviet Union. The new treaty was strongly supported by the Central Asian republics that needed the economic power and markets of the Soviet Union to prosper. However, the more radical reformists, such as Russian SFSR President Boris Yeltsin, were increasingly convinced that a rapid transition to a market economy was required and were more than happy to contemplate the disintegration of the USSR if that was required to achieve their aims. In contrast to the reformers' lukewarm approach to the new treaty, the hard-line apparatchiks, still strong within the CPSU and military establishment, were completely opposed to anything which might lead to the breakup of the Soviet Union. On the eve of the treaty's signing, the hardliners struck. Hardliners in the Soviet leadership attempted a coup d'état in August 1991 to remove Gorbachev from power and prevent the signing of the new union treaty. During this time, Gorbachev spent three days (August 19-21) under house arrest at a dacha in the Crimea before the badly planned and ill-fated attempt to restore party control collapsed, and Gorbachev was freed and restored to power. However, upon his return, Gorbachev found that neither union nor Russian power structures heeded his commands as support had swung over to Yeltsin, whose defiance had led to the coup's collapse. Furthermore, Gorbachev was forced to fire large numbers of his Politburo and, in several cases, arrest them. Those arrested for high treason included the "Gang of Eight" who had led the coup. Gorbachev had aimed to maintain the CPSU as a united party but move it in the direction of social democracy. The inherent contradictions in this approach—praising Lenin, admiring Sweden's social model and seeking to maintain the annexation of the Baltic States by military force—were difficult enough. But when the CPSU was proscribed after the August coup, Gorbachev was left with no effective power base beyond the armed forces. In the end Yeltsin won them over with promises of more money. Gorbachev eventually resigned on December 25, 1991, and the USSR was officially dissolved, with Yeltsin becoming president of the Russian Federation. Gorbachev founded the Gorbachev Foundation in 1992. In 1993, he also founded Green Cross International, one of three major sponsors of the Earth Charter. He also became a member of the Club of Rome. In 1996, Gorbachev re-ran for president in Russia, but only received about one percent of the vote, most likely due to animosity following the economic privation during his administration and the Soviet Union's collapse. While on a pre-election tour at that time, he was punched in the face by an unknown man. On November 26, 2001, Gorbachev founded the Social Democratic Party of Russia—which is a union between several Russian social democrat parties. He resigned as party leader in May 2004, over a disagreement with the party's chairman over the direction taken in the December 2003 election campaign. In June 2004, Gorbachev represented Russia at the state funeral of Ronald Reagan. In September 2004, following Chechen militant attacks across Russia, President Vladimir Putin launched an initiative to replace the election of regional governors with a system of direct appointment by the president and approval by regional legislatures. Gorbachev, together with Boris Yeltsin, criticized Putin's actions as a step away from democracy. Gorbachev remains highly-regarded in the West for having ended the Cold War. In Germany, for example, he is acclaimed for allowing German reunification to proceed. However, in Russia, his reputation is very poor because he is viewed as having brought about the collapse of the country and is thus held responsible for the economic misery that followed. Nevertheless, polls indicate that a majority of Russians are pleased with the result of the individual aims of perestroika, Gorbachev's chief legislative legacy, and the resulting freedom that came about. He is not considered by many to be the sole reason the Cold War ended as it did. The Soviet war in Afghanistan had been going on since 1979, draining Soviet resources. This and many revolutionary or reform movements in Soviet satellite and client states (well-funded and supplied by clandestine operations from the West), most notably Afghanistan and Poland, took a huge toll on the USSR's ability to maintain order and operate as a government. Some insist that arms buildups in the West also prompted comparable Soviet military expenditures that, when added to expenditures in Afghanistan, simply could not be sustained. Moreover, the Soviet economic infrastructure was in serious decay by 1985, when Gorbachev took office, and this reality arguably had the decisive impact on Gorbachev's decisions to liberalize. But in the end, according to some analysts, these attempts to "open" the Soviet Union were too little, too late, and Soviet satellite states responded accordingly, ending the Cold War era. Critics, mostly in Russia, believe the USSR was not in as serious an economic crisis as others claim and view Gorbachev as merely an incompetent politician who initiated the wrong kind of reforms, even blaming him for the destruction of the state. While it can be argued that Gorbachev sought to retain a more liberalized USSR, and never aimed at the dissolution of the Soviet state, his contributions toward peace on the global scale nonetheless outweigh the criticisms, however valid, leveled at him from within Russia. In the West, Gorbachev was colloquially known as "Gorby." In 1987, Gorbachev acknowledged that his liberalizing policies of glasnost and perestroika owed a great deal to Alexander Dubček's "socialism with a human face" in Czechoslovakia. When asked what the difference was between the Prague Spring and his own reforms, Gorbachev replied, "nineteen years." In 1989, on an official visit to China during the demonstrations in Tiananmen Square, shortly before the imposition of martial law in Beijing, Gorbachev was asked for his opinion on the Great Wall of China: "It's a very beautiful work," he replied, "but there are already too many walls between people." A journalist asked him, "Would you like the Berlin Wall to be taken down?" Gorbachev replied very seriously, "Why not?" Gorbachev was ranked #95 on Michael H. Hart's list of the most influential figures in history. Although baptized in the Russian Orthodox church as a child, Gorbachev publicly professed atheism during his political career. Nonetheless, as Soviet president, he campaigned for the establishment of freedom of religion laws in the Soviet Union, viewing the exercise of religious expression as a valuable source of societal cohesion. Finally, in March 2008, while visiting the tomb of St. Francis of Assisi, he told the Italian press that he had become a Christian, moved particularly by the life of St. Francis. Gorbachev is one of the most famous people in modern times with visible naevus flammeus. The crimson birthmark on the top of his bald head was the source of much satire among critics and cartoonists. Among his official photos there was at least one on which this birthmark was removed. Contrary to some accounts, it is not rosacea. "What would you call it when the country is being ruled by old men who keep dropping dead, and the country is left without normal leadership?" "I began to feel the desire for something more; I wanted to do something to make things better." "I believe that danger awaits only those that do not react to life," often misquoted as, "He who comes too late is punished by life" (East Berlin, October 7, 1989). ↑ Angus Roxburgh, The Second Russian Revolution: The Struggle for Power in the Kremlin (London: BBC Books, 1991, ISBN 0886876834). ↑ BBC News, “On This Day: Gorbachev becomes Soviet Leader.” Retrieved August 21, 2007. ↑ The Gorbachev Foundation. Retrieved August 21, 2007. ↑ “Reunification Politicians Accept Prize,” Deutsche Welle (June 17, 2005). Retrieved August 21, 2007. ↑ Mark Almond, Uprising: Political Upheavals that have Shaped the World (London: Mitchell Beazley, 2002). ↑ Malcolm Moore, "Mikhail Gorbachev admits he is a Christian," Daily Telegraph, March 19, 2008. Retrieved March 20, 2008. Farnham, Barbara. "Reagan and the Gorbachev Revolution: Perceiving the End of Threat." Political Science Quarterly 116(2) (2001): 225-252. Jackson, William D. "Soviet Reassessment of Ronald Reagan, 1985-1988." Political Science Quarterly 113(4) (1998-1999): 617-644. This page was last modified on 5 October 2018, at 14:44.